The Alexander Hybrid is Nest Bedding’s attempt at creating a truly versatile mattress that incorporates comfort style and luxury in one package. 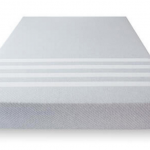 The mattress packs a huge repertoire of ingenious design tricks and specifications; from pocketed coils, copper infused gel foam, ventilated foam and host of others. 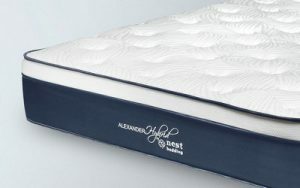 These features make the Nest Bedding Alexander Hybrid mattress stand out as a worthy challenger in the competition for the best memory foam that satisfies all sleeper category and cravings. 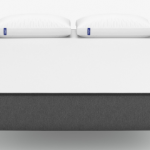 So does the Nest Hybrid Mattress deliver to the high expectations its lofty specs have set? Read on to find out. The Nest Hybrid mattress spots a cover weaved from 80% rayon and 20% polyester attached to a polyurethane foam pad that improves it plushness and overall comfort. Being a breathable cover, it also aids in keeping mattress temperature at a low level. The next layer is a copper infused gel memory foam that is 2 inches thick and has a relative density of 3,5lb/ft. The copper present in this layer acts as both a heat conductor that transmits heat away from the sleeper and an antimicrobial agent since copper is highly resistant to microbial cultures. The third layer is the same Smart flow layer that is found in the Nest Bedding Alexander Mattress. It is 2 inches thick and function to improve airflow thereby increasing the cooling efficiency of the matters. The design of this Layer is oriented in such a way as to efficiently transmit all loadbearing implication to the base or foundational layer. The base or foundational area in this mattress is made of pocketed coils that conglomerate into a 7-inch thick layer. This segment features 1872 (for the queen size) coils packed into its framework. Also integrated into this mechanics is a coil edge support system that makes sure the side of the mattress does not sink/compress uncontrollably on the impact of pressure. The Alexandra Hybrid Select comes in two variations of firmness, the medium firm and the Luxury firm. Medium firm: this is the softer of the two variations, it ranks 6 in our firmness scale where 1 connotes overly soft, and 10 represents a very hard sleeping surface. As is apparent from its firmness ranking this mattress is suited for the average sleeper who is neither underweight nor overweight. 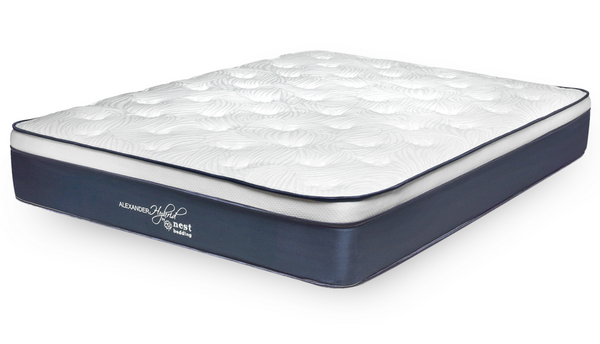 Luxury Firm; This model ranks 8 on our firmness scale and is one of the hardest mattresses we have ever reviewed. Because of its firmness, this mattress would be suitable for stomach and plus weight sleepers. Consequent of the gel memory foam, this mattress handles pressure points very well and will contour adequately around the sleeper mimicking a cradle like effect where the sleeper is cushioned in the mattress. Sinkage in this mattress is minimal, a feature that is particularly important for side sleepers. Bounce and responsiveness are off the charts as well, and this is no surprise given the pocketed coil design that is incorporated into the mattress; this design feature is one that sexually active couples would very much appreciate. From our motion transfer test, it was apparent that the Nest Hybrid mattress was proficient at curtailing the spread of unwanted vibrations and movement along the framework of the bed. This is an especially important feature for individuals who intend on sharing a bed with their partner, as it ensures that the sleeping habits of one partner do not interfere with the other. Aside from spotting a transitional layer that Nest claims to be breathable, the Nest Hybrid Signature select houses an ingenious copper infused memory foam. Nest says that this is sure to regulate ambient bed temperature within a relatively cool range. Faithful to this our testing revealed that the Nest mattress does sleep cool, especially in comparison to competitors. Working in tandem with the breathable cover and the ventilated coils, the proprietary tech of copper infusion delivers a peaceful sleep. Because Nest uses natural materials in comparison to synthetic ones in the production of their line of mattresses, off gassing is almost non-existent in this mattress. For people who are sensitive or have allergy issues, off-gassing could be a potential deal breaker, and we were quite pleased this that the mattress did not demonstrate anything of the sort. The price tag for the cheapest Alexander Hybrid is $799, while this is considerably higher than the price tag of its main competitors, once again as was with the Alexander signature select it is justified. The Alexander hybrid is packed full with unique technologies that does exactly what they were advertised to do. The Alexander hybrid also like its predecessor also gives the customer the option of opting for a 12 month Affirm financing plan instead of paying one lump sum. Apart from having physical retail outlets in the main cities of the US, Nest also uses an online sales point. The presence of a physical retail store affords sceptical customers the opportunity try out the mattress before they purchase it. And customarily, Nest still offers a 101 nights warranty that allows customers to return the mattress in exchange for a full refund within a 100-day window if it doesn’t meet the specification of the said customer. However for this clause to be active, the client has to use the mattress for 30days to facilitate its conditioning and adaptation to the environment of the customer. The mattress is shipped within 4-5 days from Nest via FedEx and takes an estimated two weeks for it to reach its destination. If need be the bed can also be shipped internationally, and If you live alone and need help setting up the mattress, that can also be arranged for prior to your delivery for a small stipend. As is seen in the Alexander Signature select, Nest also offers a 20-year non-prorated warranty coverage. Within this time frame Nest will replace or repair your mattress in the case where there are workmanship mistakes and defects in the mattress. From experience, we have discovered that most companies who offer a warranty coverage that extends beyond 15 years have utmost trust and confidence in the build quality and durability of their mattresses. If you have the tendency to drift towards the side during sleep, and you are comfortable with a significantly high level of bounce and responsiveness, then the Nest Hybrid is your best bet. The Edge support found in this mattress is nothing short of phenomenal, how it manages to accomplish this without stiffening up the sleeping experience is still a marvel to us. It is no surprise that the Nest Hybrid mattress sleeps cool; the copper infused gel memory foam ensures that unlike other memory foam which characteristically retains heat, the Nest memory foam transmits heat from the sleeping surface to the edges and bottom where it is dispersed. Want to try out the Pocketed Coil Tech but unsure it’d suit you. Eco-Friendliness; Nest, has remained committed to using biodegradable and natural raw materials in their production line. Apart from the environmental benefits of this move, it has also reduced the incidence and severity of off-gassing, a phenomena familiar with memory foams. Off gassing is usually resultant from gas build up from petrochemical materials commonly used in the production of foams. The Only issue with this mattress at its time of release was that the single variant that was launched then was just too soft to accommodate the sleeping needs majority of the consumers. Nest, showing that they indeed pay attention to and value customer feedback released a firmer option. As was expected it was a huge success as it corrected the only obvious flaw the Nest Hybrid mattress had. The mattress reeks of ingenuity and signature style that is not only a fascinating sight but also assures a quality night rest devoid of any interruptions. For individuals who like a bouncy no hug mattress that guarantees a cool sleep, the Nest Hybrid is sure to tickle their fancy.